A wealthy businessman wants to make it so Supers will be legal once again. His plan is a marketing campaign centered around Elastagirl, who takes on a new villain while Mr. Incredible has to stay home with the kids. It has been 14 years since the release of the original "Incredibles" film. Finally, Pixar has delivered the sequel that fans have been demanding since 2004. "Incredibles 2" is written and directed by Brad Bird, who also directed the original "Incredibles," as well as other animated features like "The Iron Giant" and "Ratatouille." The film picks up right where the original left off as the Parr family takes on The Underminer, from the battle to the collateral damage to a lot of bad press. A billionaire businessman named Winston Deavor (Bob Odenkirk) plans to change all that as he wants to make Supers legal again. He believes the best way to go about this is a marketing campaign centered around Helen 'Elastagirl' Parr (Holly Hunter) because statistically, she causes the least amount of collateral damage. While Helen is off doing hero work and is facing off against a new high-tech villain named Screenslaver, Bob 'Mr. Incredible' Parr (Craig T. Nelson) stays at home and plays housemaker. Jack-Jack's (Eli Fucile) new powers, Violet's (Sarah Vowell) teen angst, and Dash's (Huck Milner) math homework cause him more problems than most villains ever could. The best way to describe "Incredibles 2" is "The Fantastic Four" meets "Mr. Mom." This is a fun superhero flick combined with a fish-out-of-water comedy as Bob struggles to be a homemaker for the first time and must put his ego aside to do what's right for his family at home while his wife does the superhero duties. It is an entertaining, brilliantly animated movie that is light and flashy and has some excellent fight scenes. We get a lot of comic book style action and some fun new Supers with powers that play really well in animated form. Jack-Jack and his wide array of powers are by far the best part of the movie. We got a lot of joy out of his showdown with a wild raccoon, and this scene made our entire theater erupt in laughter. The voice acting is tremendous. Newcomers Bob Odenkirk, Sophia Bush, and Catherine Keener really nail their roles, and old favorites Craig T. Nelson, Samuel L. Jackson, and finally-front-and-center Holly Hunter are as good as they've ever been. 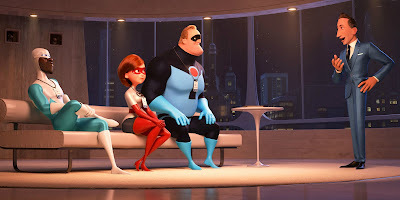 Unfortunately, "Incredibles 2" doesn't carry the emotional weight and character depth that we were expecting. It's a little underwhelming for Pixar, but it's still a delightful ride. The narrative feels sort of basic and predictable to us. Within the first few minutes, we knew how everything would play out. We saw every twist and turn coming from a mile away. Everything in the story is very surface-level and a bit trite. There are even a few elements that don't really make a whole lot of sense, though we won't mention them here because they are technically spoilers. 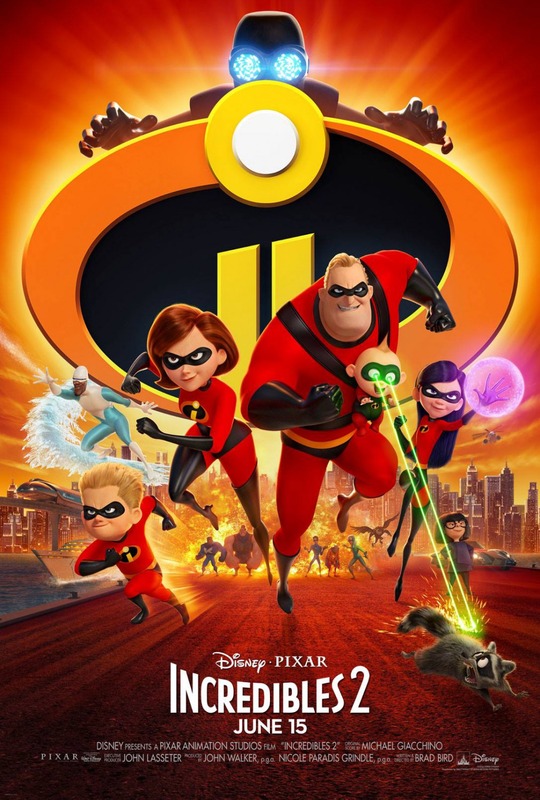 Though this isn't Pixar's best film, and though it is not as good as the original, "Incredibles 2" is a worthy sequel that will provide a good time for the entire family. The actors haven't missed a beat since the first installment, the animation at Pixar continues to get better and better, and we wouldn't hate the idea of seeing a third journey with the Parr family, so long as Pixar doesn't wait another 14 years to make it.